Subtle, delicate, exquisite. 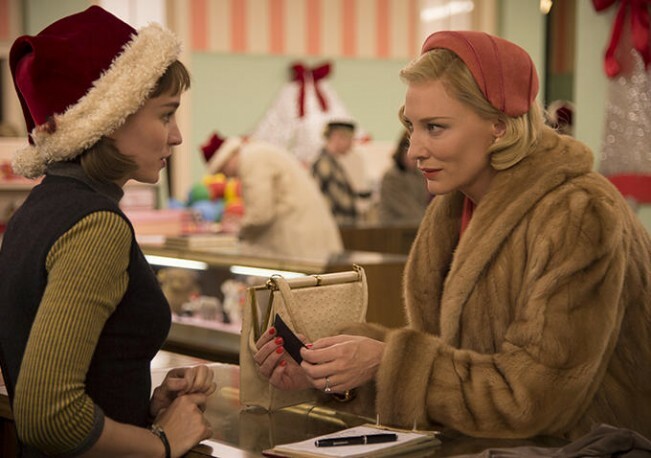 Like staying up all night to witness the blooming of a flower, Todd Haynes’ Carol is something special. Critically, films like these make you want to emote and let go and bask in the effect they leave you with. The film is an adaptation of Patricia Highsmith’s novel The Price of Salt, and lamentably I’ve no frame of reference with which to comment on the film’s fidelity to its source. I can, however, describe the way its restrained sensitivity made me feel as I walked away from the film, ruined and wistful and emotionally a mess. Full body chills danced across my skin as I reflected on the artistry, what it meant, and how great it is that it exists in a form as pure as it is. Like a sort of Blue Jasmine is the Warmest Color, subject yourself to some of Cate Blanchett’s finest acting as she plays the socialite title role, meeting and eventually falling in love with humble store clerk Therese (Rooney Mara), a romance that in the 1950s is of course immoral, unlawful, or just plain sick. But despite the institutional ignorance and conservatism, there’s a complex feeling of sympathy for almost everyone in this film: when a naïve post-war world opens its eyes beyond the heteronormative utopia sold by corporations and governments and authorities, paradigms shift. People shatter. Lives are upended. Custody battles are warred through accusations of homosexuality. Confusion. Isolation. Tensions. Sadness. The film expands to see the confused men on both sides of the coin, unable to comprehend the idea that women could love women—or as Therese says, to just love another person—and the treatment and context of the subject matter seems fair, given the time period, which is sold and told so unbelievably well. Carol has a husband (Kyle Chandler) and Therese has a Classic American boyfriend (Jake Lacy), and the latter initially seems like a sort of villain—he’s standing in the way of true love, right? But soon his traditional cheer and white-picket-fence goals becomes a beacon of existential melancholy, as Therese has a necessary heart to break in the pursuit of genuine emotion. Haynes walks this balance so, so well, never painting anyone with too broad or harsh a stroke, or opting for an editorialized point-of-view. Phyllis Nagy’s stellar, careful script informs this openness: her adaptation is a romance at heart, but there is social drama, and there is history on the television sets these characters are watching. There is the reality of the setting, and there is exceptional maturity to its depiction. Because the era itself is a character here, living and breathing with both flaws and good qualities and genuine aspiration, misguided as it may be. The utter perfection that is the costume and production design, where we’re able to fall in to the moment and sit listening to Billie Holiday’s “Easy Living” on vinyl, is so real it is almost not. I have lauded Blanchett’s performance here but opposite her is Mara, just as good and just as fine when juxtaposed against her object of forbidden affection. There’s dialogue to engage with and an Oscar Speech at the end to succumb to, but so much of this film could be watched in silence. The emotions gleaned simply through the eyes of these characters would be enough with their oceans of information, but they’re cast before Haynes’ masterful visual framing with see-it-thrice color and blocking motifs. It’s only day five, but Carol is currently the front-runner for best-in-show at Cannes, and if that is upended by the end of the festival by another drama this powerfully affecting, we’ll all be sopping messes along the Croisette.